Relive the music, fashion, and spirit of the 1980s via the incredible saga of the rise, fall, and comeback of New Wave legends Spandau Ballet. 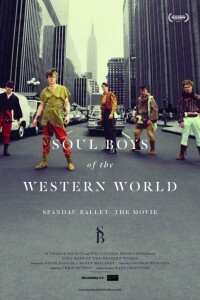 From the streets of working class London to the top of the pop charts, Spandau Ballet conquered the airwaves in the 80s with international hits like “True” and “Gold.” But the behind-the-scenes story was just as compelling, as the band overcame ego clashes and a bitter breakup to reunite triumphantly for their current tour. Featuring never-before-seen home movies, archival footage, and interviews with the band, Soul Boys of the Western World is a captivating chronicle of the rollercoaster ride of fame and an awesomely retro time capsule of the sounds and styles of an unforgettable decade. 25 years ago, U. S.